In search of the moment when consumer engagement is at its highest, brands have chosen to focus on search and social media. But – as this study proves – the rush of retail therapy is no myth, with the process of shopping making consumers considerably happier and more receptive than other online activities. This report explores the mindset individuals experience when shopping – the Transaction Moment, where happiness and engagement peak. As uncovered in this research, this mindset presents a much sought after and undiscovered opportunity in digital customer acquisition - an opportunity where both minds and wallets are open. 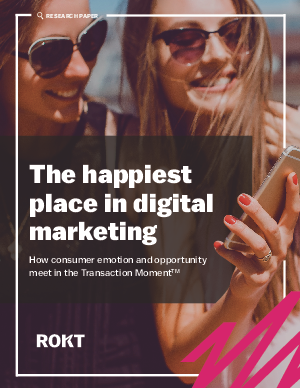 This conclusion is supported by Rokt analytics — which reveals consumers are up to 7x more likely to engage with related offers in the Transaction Moment. This report and findings are relevant to many in the marketing and e-commerce industry. Whether the objective is to acquire new customers, or to optimize the purchase journey, this report uncovers that mindset and emotion dictate much of the opportunity in digital marketing.